Optimizing a landing page can sometimes be very difficult, especially if you do not understand the art and science of it. Forms are a key aspect of any successful landing page, as they are there to gather the information that you want from the person viewing your page. If the form does not attract the viewer, then that lead on the page will be a waste of money and time both for you and for them. The form needs to have few key features. Firstly, it needs to have an introduction and the reason for why the person is required to fill in the form. The introduction needs to be concise but yet enticing enough for the person to give you their contact details. Secondly, it also has to have a call to action, to encourage them to fill in the form and therefore allowing you to gather the information that you require. You also need to throw in a few trust points in there so that the person does not feel as if they are just handing out their information to anyone loosely. It is also imperative to create urgency and not allow the person to procrastinate or pass up on the offer. The headline on the landing page is also crucial in making the page successful. If you have ever heard of the foot in the door analogy, this is essentially what a great headline does on the landing page. It forces the person to read further and find out what you have to offer. Just like the form, the headline also needs to create the sense of urgency and a call to action to make sure the viewer actually does something on the page and keep them interested. The call to action may be hard for some people to comprehend as there are a few factors (including psychology) to creating a compelling one. Similar to a sales talk, the whole campaign depends on your call to action. After all, the purpose of your campaign is to entice the visitors into making an action, which is to give you their contact details so that you can follow up on them with more information. If you do not place an emphasis on your call to action, then it would be pointless to send online traffic to your landing page. Creativity can also contribute to your conversion rate as it can bring about a sense of freshness. Familiarity can breed contempt as visitors are faced with countless similar-looking pages daily. As they are being bombarded by the same “message” repeatedly, some websites are doing wonders with weird-looking pages that leave a deep impression. 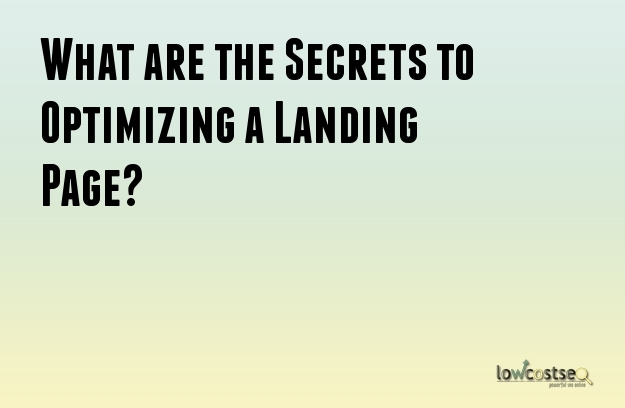 In order to optimize a landing page, it takes a series of split tests in order to find out what works and what does not. From tweaking your headline to changing the background color of the page, it takes time and effort to find out which combination works best. search engine optimization is a very good way to increase the visibility of your web page and increase the page traffic. With the right SEO Services in USA, your web site will rank high on the major search engines likes Google, Yahoo and Bing and as a result will have an increased visibility to the potential customers who search the web site with relevant keywords. SEO landing pages is a very good method of communicating with the potential customers and attracting them to the potential web sites. The visitor who comes to the web site may not always visit the home page of the web site. Instead, they may go to the page which has more relevant keywords. The SEO landing page is created with focus to particular geographical location, products or services. It may concentrate on a particular question that the customer is looking for. Creating unique landing pages is a very good trick to ensure that the visitors land on that particular page when they are looking for a particular product, service or information. As the web pages are optimized with only a few specific keywords, creating landing page with those particular keywords can work wonders in attracting the traffic to the web site. But it is important to make sure that the content used in the pages is fresh and unique. The content should also be specific, focusing entirely on the keywords. If the content of the page is focused, then the rate of conversion will also go up significantly. Include all important elements- These pages are designed to capture leads and customers. They are used to attract the potential customers hence they must have all the information that the customer may need. ·Control navigation- You must always aim at keeping your visitor in your landing page. If you include links on the page for navigation or movement to the main page, the visitors will get distracted and they will not stay on the landing page for long. ·Keep the headline and the content consistent- Keep a consistent message on the headline and the CTS so that the customers trust you. If there is anything that is confusing, you should delete it in time. ·Keep it simple- Do not go over the board with your web site or make it cluttered. Since the page is focused on a particular theme, you should not allow it to become confusing for the visitors. They should directly find what they are looking for. From content to images, everything must be simple and to the point. ·Highlight your offers- The purpose of landing pages is to increase the conversion rate, hence you must offer the potential customers some deals and promos. Make sure that the web site highlights those significantly and the customers are able to find it easily.Create more than one landing pages- More landing pages you are able to create, more leads you can generate.Contact your SEO service provider to know about landing pages and go for SEO Packages that include this.